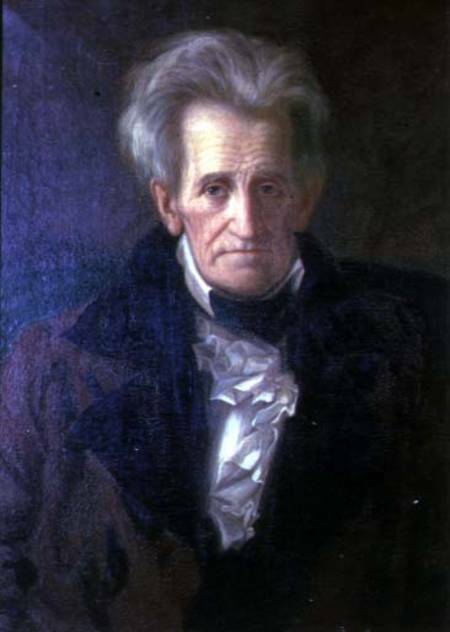 This portrait of a weathered and aged atrocious saint was completed shortly before Andrew Jackson’s death in 1845. I could leave it at that and you would have enough words to chew on for the next fortnight…The seventh President of the United States was wont to say that he was “Born for a Storm” and there is literally no way to deny him his catchy mantra, especially given all the evidence that time, history, introspection and inspection both contemporaneous and historical has provided. He was absolutely and resolutely a rebellious lout with a firm desire for order and a penchant for revolution. Like him or not, he was a conundrum and a contradiction that equaled momentum for his time and his legacy. A troublemaker and a troubleshooter, and regardless of his flawed reasoning, less than admirable morals, questionable ethics and inconsistencies he was, and is, an enigmatic example of every amazing thing that makes America the good, the best, the worst and the constantly evolving. If ever you are in the Nashville, Tennessee region a visit to The Hermitage would be well worth your time. 2) Aside from Meth and the Kardashians perhaps the most invasive fetish and addiction of society is not only resulting in a reduction of attention spans and the decline of the general public’s propensity for logical reasoning but also contributing greatly to the demise of the Fourth Estate, both literally as well as its soul. What loathsome plague do I speak of? Nothing more, and nothing less than viral video. It isn’t even the content, it’s the engagement and the reach that is important. It is the most modern version of ye olde chair being crashed across the back of the dumbfounded and incredulous baby daddy on Jerry Springer circa 19 something (I have no idea when that sort of thing actually happened but I know it was after 1984 and before 2015 and there is no way I am going to Google it. I would rather Google “One Cup” and be subjected to that display). Don’t get me wrong, I love a water skiing squirrel or a Roomba riding cat as much as the next gal….but when THE NEWS and their outlets and Social Media platforms resort to sharing and promoting these sorts of thing based merely on the metrics of reach & engagement and in order to trap and encourage site traffic I guess I have to ask, “Where the hell did it all go wrong?” I am perfectly aware of the long and illustrious tradition of tabloids and headlines and the efforts media and journalists have used for CENTURIES to gain and retain readers and customers. And yes, back in the day when missiles and tough talk by Presidents, Prime Ministers and evil Soviets filled the newscasts I was slightly comforted by the teasers throughout the nightly news and then the quick clip of the newest panda born at the zoo. And yes, I always thought the stiff in the suit looked like he had a gun to his head to have to report it…but ratings beget sponsors and sponsor beget money and since I am really not a big fan of State Run television I was okay with it. Walter Cronkite and David Brinkley were okay with it. However, I doubt they would be okay with videos being promoted as “news” when in fact they are nothing but pathetic attempts to further hidden (or less than hidden) agendas and utilized by “news agencies” purely to incite and or provoke reaction, not for the exchange of ideas but for the “clicks” and the “numbers”. It’s a fine line. For me that line was crossed by our local television station WMTW when their parent company uploaded content onto their Facebook page that not only contained erroneous supposition, blatant falsehoods and egregious agenda driven drivel, but directly impacted something that is a little important to me: milk. The video purported that a cow “rescued” from a dairy farm in Australia by an animal rights group had hid her calf from humans because she was supposedly sufering from repeated losses of calves to evil farmers. Of course prey animals have that instinct (note: instinct, not higher reasoning or sentient capabilities) but since the whole purpose of the video was to attack animal agriculture the video made every attempt to pull at heartstrings and exploit the facts that literally some of those who commented pledged to never drink milk again. And not people from a far off distant metropolis…this was coming from people right down the road in a state that enjoys 700,000 acres of open space, almost 5,200 jobs, almost $600,000,000 in state and municipal taxes and lots of business and economic bonuses due to its dairy industry. Oh, and fresh, local, high quality milk. It’s just sad. I guess it was better than watching a pilot be burned to death. But I am not convinced that there was not a serious discussion as to whether or not to air that clip. All in all I think its pretty sad that people make the news because they get outwitted by a postpartum cow in a game of hide and seek. A producer at the station told me that that sort of video wouldn’t have an impact on my milk. He also told me it was chosen not because of its content but specifically because it was viral. I guess maybe he could be right that it won’t affect the confidence of our consumers with regards to the quality of care we provide our animals and the trust they can rightfully place with us when it comes to knowing that milk comes from a good place. Not due to anything on their part, but due to the attention and vigilance of dairy farmers who took the time to answer questions and correct the misconceptions. The same cannot be said for WMTW and this citizen. They have lost me and I will certainly hide my offspring from them. Seriously, dude!!! She’s wielding a frickin sword of science. 3.14) Because I just cannot stop thinking about it: Freedom. Of. Information. Act. A tool of justice and freedom. Not a bludgeon. Just a reminder….please join Big Red and others by signing this petition. I get that some folks don’t like the idea that some scientist made their life better but I don’t get why they are hell bent to put civilization back a few hundred years (or maybe a thousand) by muzzling voices and isolating minds. And while I am on the subject, the world is not flat. * and by “good thing” I hope I didn’t offend anyone who prefers that science doesn’t get involved with creating and re-creating what nature has already perfected …like in this case an arm. Which, even though nature has seemingly perfected arms, science managed to tweak it just enough to make it work for everyone. Hmmmm.. Imagine that.